Equistro Secreta Pro Max is a complementary feed supplement that combines a selection of herbs and Vitamin-E that support the respiratory system in horses. What is Equistro Secreta Pro Max? Equistro Secreta Pro Max is a pelleted complementary feed designed to be added into a horse’s daily ration. It is particularly recommended for horses requiring a clear airway and healthy respiratory system to optimise their well-being and performance. Before being released on the market, every Equistro Secreta Pro Max batch is analysed for environmental contaminant, ensuring that the product does not contain ingredients likely to make a positive doping test. What are the benefits of using Equistro Secreta Pro Max? 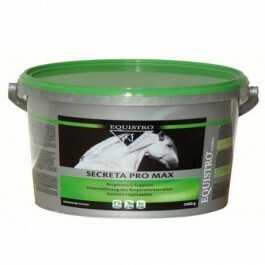 What is in Equistro Secreta Pro Max? Black horehound (ballotta nigra) 13.6%, Thyme 13.6%, Barley flour 12.6%, Burdock 8.2%, Grindelia 8.2%, Liquorice 8.2%, Carob pod 6.8%, Climbing ivy (hedera helix) 5.5%, Coltsfoot 5.5%, Mullein flowers (verbascum thapsiforme) 5.5%, Lucerne flour 4%, Pregelatinized potato starch 0.9%. Additives/kg: Vitamins and pro- vitamins: Vitamin E/all-rac-alpha-tocopheryl acetate (3a700) 21800 IU. Aromatic substances: Grape extract 13630 mg.
How do I use Equistro Secreta Pro Max? Horses (500 kg): 10 to 20 g (1 to 2 scoops) per day. Foals/ ponies: 5 to 10 g (½ to 1 scoop) per day. During the first 7 days, the above quantities should be doubled.